I’ve done it a half dozen times, but no matter how many times I drive the Garden Route, South Africa’s most famous road trip, it never gets old. There are simply too many new things to discover with each passing journey. One thing that never changes about this drive, however, is the scenery. 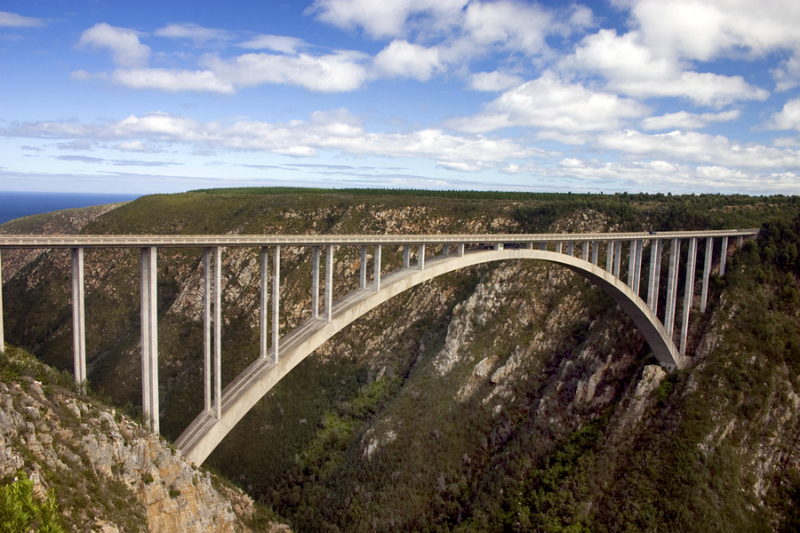 Covering a 100-odd-mile stretch of Indian Ocean coastline along the N2 highway — beginning east of Cape Town at Mossel Bay and finishing up around Storm’s River and the Tsitsikamma Coastal National Park just west of Port Elizabeth – the scenery is some of the country’s most stunning. The route follows the sea, but there is more than just surf and sand to see. The Garden Route has some of the largest indigenous forest tracks in South Africa and the narrow coastal plain you’ll drive along is often forested and bordered by lagoons running behind dunes to the superb beaches. Mossel Bay is the official start town of the Garden Route, and the town is far from easy on the eyes — it is home to offshore oil drilling and has a decidedly industrial façade. If you’re looking to catch some waves, however, this won’t be an issue. The Mossel Bay Peninsula boasts five awesome and dependable reef and point breaks to ride. Although I wish I could claim to be good at surfing, I’m not. But my traveling companion on one journey was, and after popping into a local surf shop and chatting up the proprietor about where to ride, he came back smiling from near perfect conditions and a crowd-free sea. I do recommend wearing a full wet suit when surfing here, as the ocean temperature is still pretty chilly. 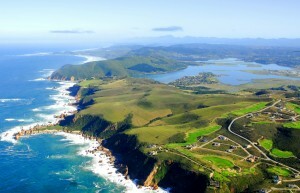 From Mossel Bay it is about a 1.5-hour drive east to Knysna, where I recommend spending two nights. A boisterous town with a holiday atmosphere, it sits on the edge of a large lagoon. It isn’t known for its beaches, but is famous for its oysters, which get their own annual festival in July. Start at the Kynsna Oyster Company, located on Thesen Island in the lagoon. They’ve been growing their own oysters here since 1949, and offer processing plant tours that include a tasting of wild and cultivated oysters paired with wine at their onsite restaurant. From here, check into your hotel for the next two nights. The Phantom Forest Eco Reserve is located about three miles west of Knysna on the Phantom Pass Road. I love this 137-hectare private reserve for its boutique sleeping digs: guests are housed in one of 14 elegant tree houses with unique designs. You’ll want to have dinner at their restaurant. Located in a forest boma, it does an award-winning six course African dinner nightly. There is also a delightful spa for rejuvenating massages on site and organized nature walks for guests. The next morning head back into town for breakfast at The East Head Café, which is on a spit of land known as The Heads. Sit outside on the patio overlooking the water, and order the smoked salmon, eggs, and cream cheese breakfast. After you’ve finished dining, head over to the Head Adventure Center, where you can do boat and short entry dives to Jacobs Reef (which is considered one of South Africa’s top 10 dive spots), as well as the deeper Grootbank. Both sites have an array of sharks and other large fish, but Grootbank, at 30 meters, has larger sharks as well as lots of caves to explore. The shop at the center will rent snorkeling gear so you can do the marked trail around the lagoon. The water here is a bit warmer, but renting a wet suit is still recommended. In the afternoon, book a township tour with Eco Afrika Tours. Townships here look very different than in other spots in South Africa. Knysna is home to the country’s largest Rastafarian community, and in their township, the government turns a blind eye on marijuana cultivation for personal consumption in accordance with the residents’ religious beliefs. Pot aside, Knysna’s townships are interesting from an architectural perspective. They are built mostly from wood rather than the traditional corrugated iron, giving them a distinct look. When you’re finished, it’s time for dinner. This time, head to 34 South at the Knysna Waterfront and start with some wild oysters. The restaurant has outdoor tables looking out over the water and also does delicious salads, sandwiches, and seafood. The wine selection is the best in town. 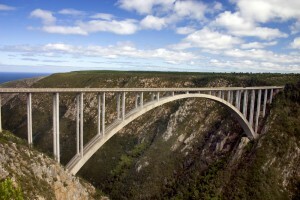 Plettenberg Bay is a 30-minute drive from Knysna and your next stop on this route. It’s an upmarket resort town where the rich come to play — think of it as South Africa’s Laguna Beach. You can expect plenty of posh homes dotting the hills above the ocean, along with upscale boutiques and fancy restaurants on the city center’s main drag running parallel to the white-sand-meets-nearly-turquoise sea beyond. There are some excellent surf breaks here as well. From Plett, it’s just about an hour drive through stunning forest scenery to the end of the Garden Route at Storms River. A narrow band of spectacular coast between Plettenberg and Jeffrey’s bays, this area is also home to some of the country’s most famous walking trails. The 41-kilometer Otter Trail is an easy five-day walk along the spectacular coastline protected by the Tsitikamma Coastal National Park in the Eastern Cape Province. There is basic accommodation for hikers along the Otter Trail. You have to book in advance through the National Parks Board. If hanging from your ankles isn’t your thing, try some black-water tubing. Don’t miss this tiny and scattered hamlet with tree-shaded lanes at the extreme eastern end of the Garden Route. The surrounding landscape isn’t hard on the eyes either — the pointy green mountains roll right into the town. This article was originally published on AFKTravel. Want to discover the finer side of Africa? Sign up for the weekly newsletter. Got my tickets to South Africa today. I’m heading back to the continent for the 11th time in May. On the next adventure I am heading first to Durban to attend the Indaba Travel Show and then to my favorite city on the planet, Cape Town. I have nearly 10 days to play around Cape Town, so I’m considering heading back to the Garden Route, which I write about here in a post for AFKTravel.com, but maybe this time visit the Gondwana Game Reserve near Mossel Bay. Anyone have any thoughts?